I am not declaring these pants done right, I am saying I am done. 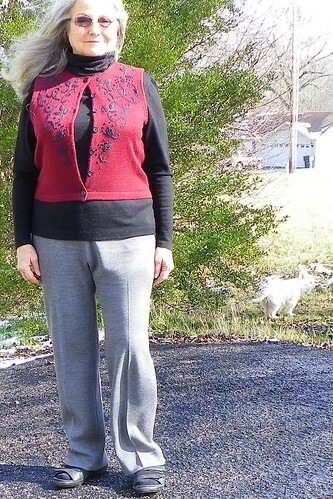 Doubleknit wool is not my favorite for pant making. See, I can decide to stop and admit I won’t make a silk purse from a sow’s ear. Every new pose brings new wrinkles and I have been making myself crazy trying to fix them. My intent for these pants is to make something to wear under tunics so really the badness of this pant will be covered by a top layer that will fall to the thigh. That was the original plan and in spite of obsessively diagnosing and unstitching and restitching, I must save myself and move on. I have completely reshaped the legs to be a very slight boot cut, skinnier to the knee and then flaring 3/4 inch to the hem. The boots I usually wear in winter have higher heels than these (yup, you saw that, right?) sandals with socks. Oh, I am shameless today! I removed the over-locking through the crotch and did not “stabilize” the seam. As it is now, the seam is stiff and continues to fold, twist and bunch, no matter what. Adding more fabric or thread would only exacerbate those problems. My original draft was a tracing of a pant made 5 years ago from a woven wool. I intentionally made 1″ seam allowances in the cut and then removed much of that extra fabric in the tweaking. As you can see even a fairly hefty full bodied knit falls too close to the body for a woven draft. I cut these after a couple month’s worth of cold/virus/whatever and I had lost weight. Much to my surprise food seems to be a good idea again and my size has since changed. 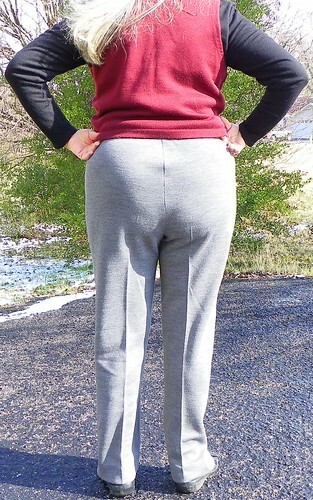 These pants are now too tight through the upper hip. Eating will do that! But it is so good to want to eat again, that I’d rather have this pant problem than to be back in bed, guzzling water. 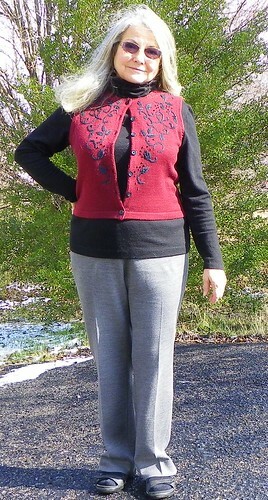 I have another pant cut at the same time, in a bit thinner fabric. A new pattern is coming in soon that may save me from further angst with doubleknit wool. This pair took too long and the fit is like a 80’s sweat suit. On to making tunics. 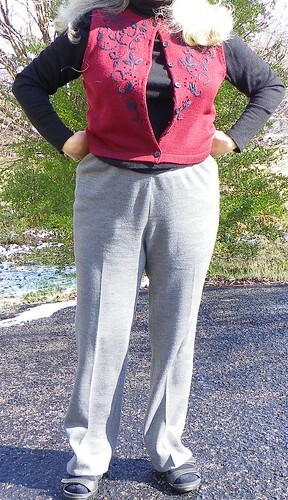 So, Folks, that’s all I have to say today on the subject of doubleknit wool pants. The obligatory dog show. Gaely GoLightly is a fun snow dog! She disappears into the landscape. She loves to roll in the snow. Posted in Dogs, Fabric, Sewing. Bookmark the permalink. There are those fabrics that you just cannot beat into submission, no matter how hard you try! Although, if you observe people, you will see pants that are much worse than those. But, we are picky sewers, aren’t we?